It was Father's Day in Asia yesterday. As I was swamped in the cold and boredom in Tasmania, Candyman reminded me about the occasion and volunteered to arrange the gift for my dad. Candyman became the best from the second best when he had decided to deliver them in person in a taxi. He is sweet like a chocolate coated candyman. My candyman! Dad and mum were happy with the little surprise. I was more than happy and was surprised with the idea. What I was wishing for was to be able to be home with them, having tea and touring my house while talking about me for an hour or so. Candyman, I remember what I've promised - a big big kiss when I see you. Can someone tell me when will that be? When my Mr20 is more than 20! 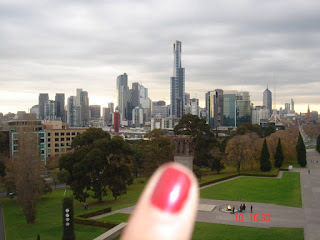 That's taken from the Shrine of Remembrance. I was kiasu, wanted to feature my finger in the picture. October, fingers crossed I don't f*ck things up like always before October. hmmm was just wondering where u disappeared to..